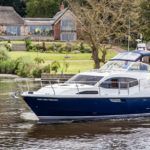 The Haines 360 offers both river and sea going abilities. 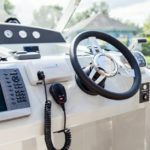 Semi displacement hull form, single and twin engine options, a great ensuite aft cabin with an island double berth. And Haines’ endless degree of choice. 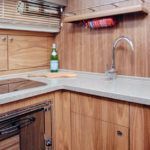 With island berth and en-suite head with sea toilet to holding tank, vanity basin and shower,cupboard, drawer unit and 2 hanging lockers. 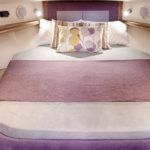 Fwd Cabin Island berth double with storage under (option of V-berths), hanging locker, bedside cabinet and shelves around berths. To starboard with sea toilet to holding tank, vanity unit with basin and mixer tap. 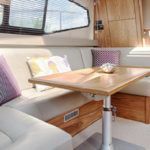 To port with large work surface, 130l fridge, 3 burner gas hob, oven and grill, 2 square sinks with mixer tap, cupboards under, high level shelves. 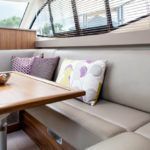 To port cupboards with shelves and a free-standing settee, stairs to aft deck, U-shaped settee to starboard converting to double with storage under, large rectangular table. 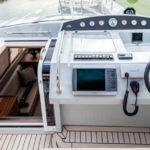 Helm to starboard, dash with full engine instruments, canopy, deck storage lockers with cushions, pushpit rail with dodgers, steps to extended bathing platform and swim ladder.